So Where Do All Of Those Boxes Come From? Every product manager knows that in order to be successful and to have something that they can add to their product manager resume, their product has to meet the needs of their customer. The world of pizza boxes is no different. In the U.S> a company called Rock-Tenn Co. is in the business of making pizza boxes for most of the large pizza chains: Pizza Hut, Papa Johns, Dominos and Little Caesar’s. Each one of these customers wants a pizza box, but they all have unique needs. One of the big challenges in creating a pizza box that will meet your customer’s needs is to combine the process of creating the cardboard container with the printing of information on the outside of the box. 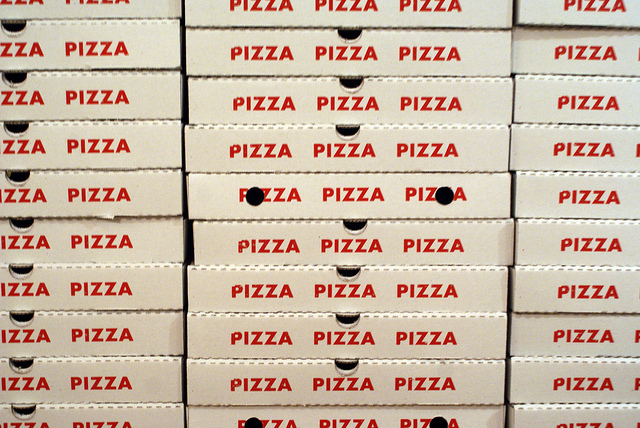 Rock-Tenn makes roughly 3 million pizza boxes every day. The customer base for pizza boxes consists of the 65,000 pizza stores that exist in the U.S. Raw cardboard is first run through a printing press to place the correct pizza chain logo and any promotional information that they want to have on the box and then the cardboard goes through a second set of machines that crease, cut and trim it into a standard pizza box. Ensuring that their customers have the pizza boxes that they’ll need in order to deal with the surge in orders during the Super Bowl takes careful planning on the part of the Product Manager. The pizza industries busy season runs from Halloween up through the college basketball tournament in March. The Super Bowl falls right in the middle of this season. The pizza chains expect to double their normal volume on this one day. The product managers at Rock-Tenn start to increase their production of pizza boxes by 10% starting in the middle of December in order to meet this need. Product managers realize that just creating a pizza box is not going to be good enough in order to keep their product in demand or their company in business. Instead, what they are going to have to be doing is talking with their customers and understanding what their unique needs are. One way to do this is to reduce shipping bulk so that more boxes can be shipped in the same sized containers. Some pizza box manufacturers have accomplished this by reducing the thickness of the corrugated layer part of the cardboard. Pizza Hut has been very interested in saving paper when it comes to their boxes. This reduces their costs, makes them more environmentally sensitive, and reduces the weight of a collection of pizza boxes. They’ve worked with the pizza box manufactures in order to identify ways to cut down on the amount of cardboard that a single box required. The end result has been a box that has both rounded edges and requires a reduced number of folds in order to assemble. Another challenge that product managers have had to deal with is the simple fact that the pizza that is placed in the box is hot. This means that steam is rising off of the pizza from the moment that it is placed into the box. Something has to be done with that steam – if you don’t get rid of it, then you’ll end up with a soggy pizza. In order to solve this problem, vent holes have been added to the boxes along the creases and a larger vent has been placed where the finger hole goes in the lid. The world eats a great deal of pizza. Most of this pizza arrives in a pizza box. The manufactures of pizza boxes need product managers in order to make sure that they are creating a product that will meet the needs of their customers both now and into the future. The pizza box product managers take the time to listen to their customers in order to determine what their needs are. Pizza chain logos and promotional material is printed on each box. Based on their product manager job description, product managers are always looking for ways to improve their pizza boxes. The amount of paper required to create a box has been reduced and ways have been found to allow hot pizza steam to be vented from a box. I wish that I could say that any of the products that I’ve been responsible for were associated with something as delicious as pizza! These product managers have the benefit of being responsible for a product for which there is a great deal of need. However, they are going to have to keep innovating in order to make sure that another company doesn’t come along and take their market share away. Question For You: If you were a pizza box product manager, how would you make your product stand out? When you go to the movies, how do you buy your tickets? I’m willing to bet that your answer was not “online”. Yeah, sure, sometimes if the movie is going to be really popular or if it is critically important that you get your hands on a ticket, then you might go online and buy your ticket there. However, most of the time you probably get it the old fashioned way – you stand in line and buy it at the window. If you were the product manager working at one of the companies that sell movie tickets online, this would indicate that there is a real problem with your product development definition.